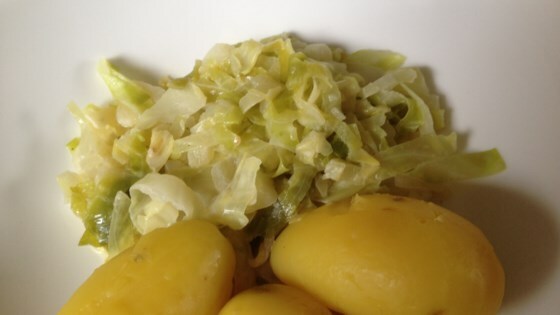 "Pointed cabbage has a milder taste than regular cabbage. In this easy recipe it is cooked in a vegetarian cream sauce with onion and garlic into a yummy side dish." Melt butter in a pot over medium heat and cook onion until soft and translucent, about 5 minutes. Add onion and garlic and cook until fragrant, about 30 seconds. Mix in pointed cabbage. Pour in broth and bring to a boil. Reduce heat and cook until liquid is almost all evaporated, about 5 to 10 minutes. Stir occasionally. Pour in cream and bring to a boil. Reduce heat and season with salt, pepper, and mace. Simmer everything on low heat until flavors are combined, about 5 minutes.